Use this 100% chart for a 60kWh new battery. Update: - 9 October 2012, Added chart version "7G". Each PDF file has English (first page) and Metric (second page) measure. 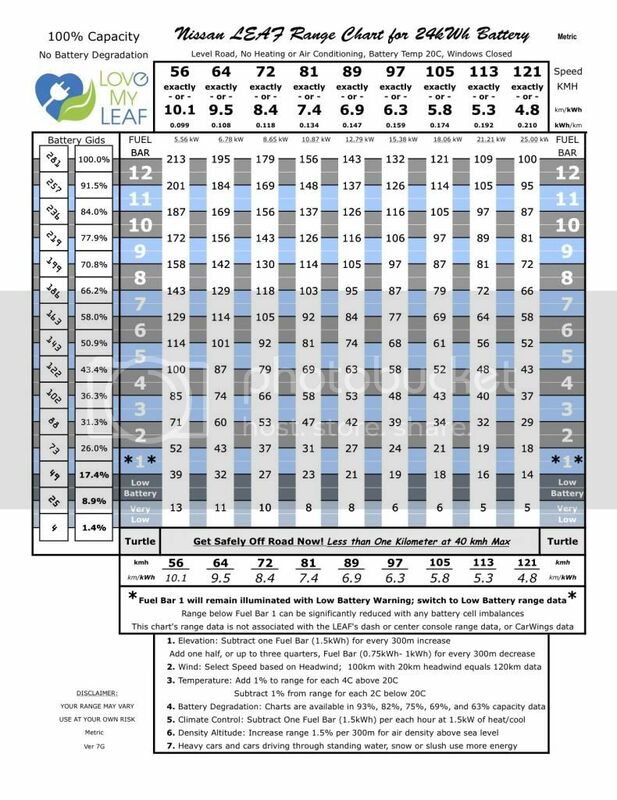 Use this 100% chart for a factory new battery. Use this 93% chart for a one year old or more battery that still has all 12 capacity bar segments. Use this 82% chart for a battery that has 11 of 12 capacity bar segments. Use this 75% chart for a battery that has 10 of 12 capacity bar segments. Use this 69% chart for a battery that has 9 of 12 capacity bar segments. Use this 63% chart for a battery that has 8 of 12 capacity bar segments. The Nissan LEAF has been tested under the EPA Urban Dynamometer Driving Schedule, a laboratory test commonly called the LA4 test cycle, which represents city driving conditions. Top speed is 56.7 mph and average speed is 19.59 mph. Ambient temperature can vary from 68 - 86 degrees. Climate control is off. The Nissan LEAF easily achieved 100 miles. If you decide to use this chart, you can print it out and carry it in your car for reference. Your range may vary. NOTE: the JESLA portable charge cable from http://www.QuickChargePower.com" onclick="window.open(this.href);return false; can charge any LEAF from the slowest 12 amp to 30 amps using 100 - 250 volts. It can also charge a Tesla Model S, Toyota Rav4 EV, or Mercedes B-Class ED at 10kW (40 amps at 250 volts). Obviously, the charger will output some value below those stated above, at about 85-90%. So, a typical LEAF drawing 16 amps at your North American house's 240 volts will put 3.3kW into the battery, and draw 3.8kW from the wall. The new 2013 LEAF with optional 27.5 amp charger will be about 6.6kW at 240 volts. The 2013 LEAF-S retains the 16 amp charger of all previous LEAFs. Last edited by TonyWilliams on Fri Mar 24, 2017 6:46 am, edited 66 times in total. Nice. I'll probably move this to its own thread. Very nice graph. However, it's far too complicated for the average driver and, given the inability to accurately measure the output in kW, ultimately not that useful even for those who could understand it. Interesting chart - the "projected battery discharge curve" and the actual battery discharge curve don't seem to be in great agreement. It would be interesting to know what caused the actual discharge to have the inverse curvature to the projected (looks like two spots where the curvatures are opposite), and see if there is a way to extend that actual discharge behavior. Is it just speed/load/discharge rate? Seems the graph is missing a critical axis of information. Very nice! 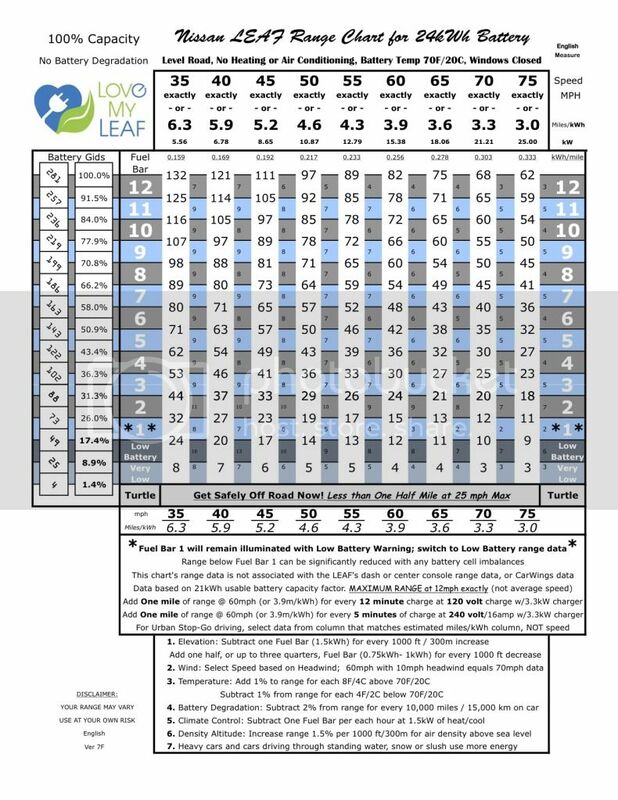 Any chance you could put this into a PDF link, it would be nice to have laminated in the car for my wife and I to help reinforce good speed habits and to give a decent way to predict range. Doesn't seem like someone should be studying spreadsheets while driving. I prefer the Ford mockup of the 'waterfall' range graph. Great job! Might want to point out that this is with the latest firmware even though I am sure there only a handful of Leafs running the old firmware including mine. SanDust wrote: Very nice graph. However, it's far too complicated for the average driver and, given the inability to accurately measure the output in kW, ultimately not that useful even for those who could understand it. Huh, far too complicated for the average driver? It's just a table. Are we assuming that the average driver can't read a simple table? As long as Tony based his chart on reliable data, I think it's amazingly useful.